Hope to be back soon with recipes. I prepared this simple and easy pasta dish for my kids. This can be prepared for after school also. Water to boil pasta, salt and 1 tspn olive oil. Optional - vegetables and olives. Boil enough water, add salt and olive oil. Heat a kadai, add butter let it melt a bit.Add garlic and saute. Add flour and saute for few minutes. Add water and milk and stir without forming lumps. Add salt, pepper powder, herbs. and let it cook and be creamy. Pasta sauce is ready. once its cooked well and thick. Off the stove and serve hot with cheese. 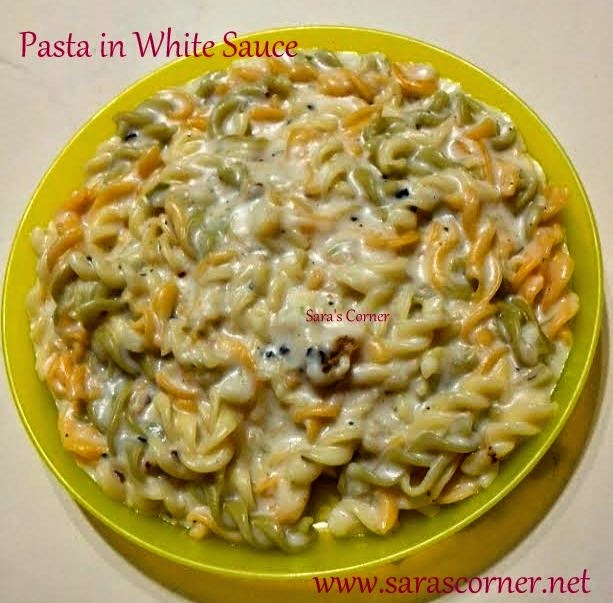 Pasta in white sauce is ready. Notes - To make it more creamy can add cheese slice to the sauce.